Kevin Hart and Ice Cube reunite once again in the first trailer for Universal Pictures' Ride Along 2, arriving in theaters January 15, 2016. We haven't seen anything from this sequel since last summer, when Kevin Hart and Ice Cube posted a video from the set. Thankfully we now finally get to see this all-star pairing in action with the first trailer, which indicates that this sequel may be an even bigger hit than its predecessor. 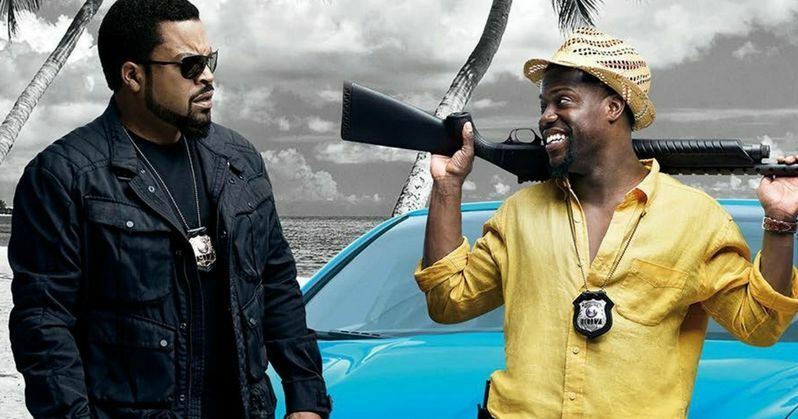 Kevin Hart and Ice Cube lead the returning lineup of Ride Along 2, the sequel to the blockbuster action-comedy that gave us one of the most popular comedy duos of this past decade. The story shifts from Atlanta to Miami, as Kevin Hart's Ben Barber and Ice Cube's James Payton team up for a new case. The original Ride Along became a box office hit last January, taking in $134 million from just a $25 million budget. The original Ride Along followed Ben Barber, a lowly security guard, who is trying to work up the courage to propose to his girlfriend, Angela Payton (Tika Sumpter). The only problem is Angela's brother, James Payton, a hardened Atlanta police detective who doesn't think Ben is right for his sister. In an effort to prove his worth, Ben goes on a 24-hour Ride Along through the streets of Atlanta. The original ends with Ben becoming a cop, leading to this unique duo teaming up for a case in Miami. Tika Sumpter also returns for the comedy movie sequel as Angela, along with a slew of new cast members. Coming aboard for this follow-up are Olivia Munn, Ken Jeong, Nadine Velazquez, Glen Powell and Benjamin Bratt. Tim Story returns to direct the follow-up, with Ice Cube also producing alongside William Packer, Matt Alvarez and Larry Brezner. Ride Along 2 will go up against Paramount's 13 Hours: The Secret Soldiers of Benghazi, Sony's The 5th Wave and Open Road Films' The Nut Job 2 when it hits theaters next January from Universal Pictures. Based on this new trailer, do you think this sequel has what it takes to be an even bigger box office hit than the first Ride Along? Check out this first footage, and stay tuned for more footage from Ride Along 2.